Whether you've been together for years or are cozying up to someone new, the restaurant choice can make or break a date night. From intimate ambiances to indulgent cuisine and wine, we've narrowed down some of Long Island’s best spots for a night out with your sweetie. Here are five restaurants that serve up incredible meals in a romantic setting. Dine Gatsby-style in a historic Gold Coast mansion on the North Shore of Long Island. Reminiscent of a French chateau, this stunning estate is the essence of romance and old world charm. The restaurant is surrounded by magnificent views of their lush formal gardens. 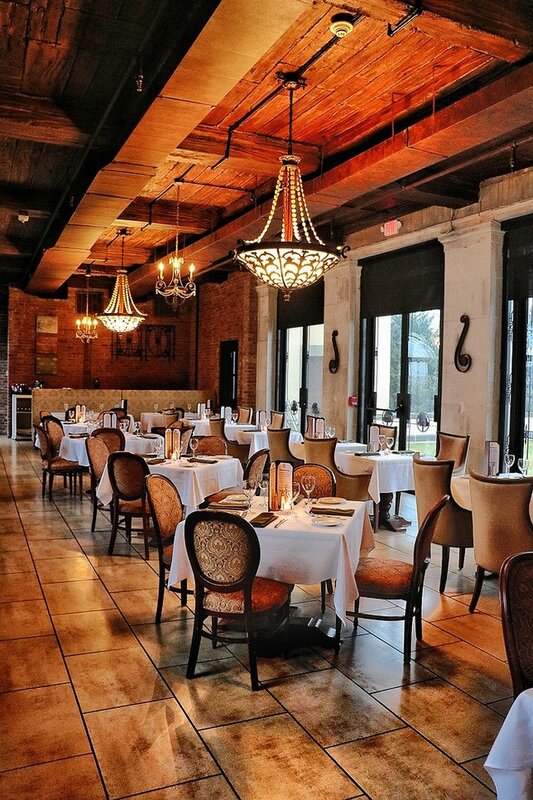 Inside, the dining room offers comfortable seating with white table clothes and crystal chandeliers, the perfect spot for a special date night with your significant other. Some menu stars are the Mini Lobster Rolls, Pine Nut Crusted Sea Bass and their Pan Roasted Duck. Reservations recommended. The Lakehouse serves upscale New American cuisine and delicious cocktails. The cozy yet elegant interior is surrounded by beautiful views of the Great South Bay and Marina. During the summer, couples can enjoy a post date night cocktail on the illuminated deck and enjoy conversation by the garden fire pit. Some of our menu favorites are the Crispy Suckling Pig, Caramelized Local Sea Scallops and the Grilled 21 Day Aged NY Strip Steak. Reservations recommended. Situated inside of the Fox Hollow Inn at the top of a beautiful staircase, Volpe features mouthwatering Italian cuisine with their very own signature twist, marrying old-world recipes with new. The space is decorated with warm, elegant accents, giving it the utmost romantic feel for date night. Luckily, guests can also enjoy the spectacular views of the estate’s stunning grounds. Start your meal off with their Caprese and Volpe Salad. Next, we suggest dinging on their Capellini Pescatore and Branzino all Espresso. Volpe also offers vegan options as well. Reservations recommended. The perfect setting for date night, One North offers soulful Mediterranean in a beautiful modern setting. The decor features a dramatic dining space with curved walls, soaring architectural ceilings and an endless panorama of glass providing gorgeous views of lush landscaped grounds and outdoor terraces. When first arriving, guests can enjoy a glass of wine and some meats and cheese at the mozzarella bar. But don’t fill up on pre dinner aperitivo. Menu favorites are their phenomenal sushi and crudo, their whole fish options, and a standout dish, their Australian Wagyu Sirloin. Pro tip: Don’t pass up on the West African Salt Prawns, the perfect pairing to your steak. Reservations are recommended. According to the NY Times, La Plage is deemed the most romantic restaurant on Long Island. With a stunning beach front location offering both indoor and outdoor seating and views of the Long Island Sound, couples will love the space offering up creative fish-centric French-American cuisine. We recommend starting with their Tart Green Apple Salad, the Apple Wood Smoked Beef Carpaccio and finishing off with any of their fresh fish dishes, you can’t go wrong. After dinner, couples can enjoy a romantic stroll on the beach. Reservations recommended. Subject: LongIsland.com - Your Name sent you Article details of "Five Romantic Long Island Date Night Restaurants to Visit This Weekend"